President Donald Trump talks with Gov.-elect Gavin Newsom, left, and as California Gov. Jerry Brown listens during a visit to a neighborhood impacted by the wildfires in California. 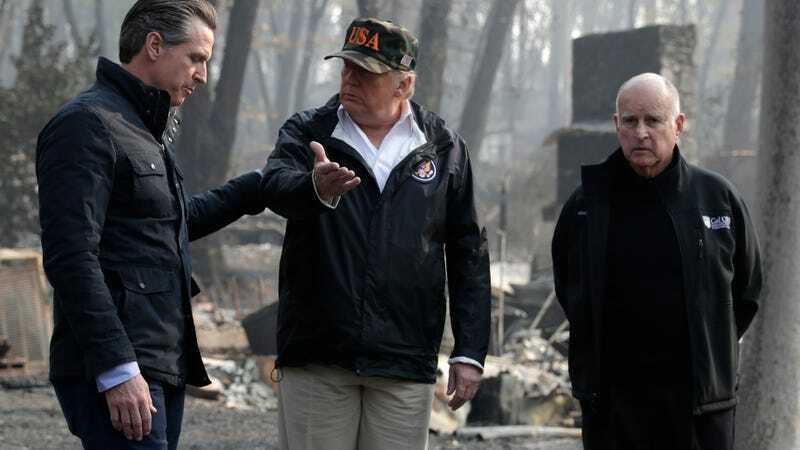 While visiting California this weekend, President Donald Trump said Finnish President Sauli Niinisto told him that “raking” was part of the country’s forest management before insinuating that it’s something the United States should be doing to mitigate wildfires. The remark was bizarre, to be sure. But now, Niinisto says that no such conversation ever happened. Answering questions from reporters with California officials about the state’s wildfires on Saturday, Trump said that management of the “floors of the forest” was important for avoiding future environmental catastrophes like the Camp Fire, which has become the state’s deadliest and most destructive fire in its history. He then pointed to a conversation he claimed he had with Niinisto. Beyond the fact that Finland’s president insinuated this conversation about raking happened exclusively in Trump’s mind, perhaps at the very moment the words fell out of his mouth, it is not the first time Trump has mentioned raking in relation to California’s fires. Just one day before visiting Paradise, the California town that was essentially burned to the ground by the Camp Fire, Trump again mentioned raking. As it appears that his cited source now denies any such conversation ever happened, it’s unclear how or why the president has latched onto this bizarre and vastly oversimplified solution to a complex problem.